I have genuinely missed blogging! So then why haven't I blogged? I'm sure you can already guess my answer, but I've just been busy. The worries of every day life has gotten the best of me. On top of that, I was feeling a bit uninspired, to be honest. 1. Tired, so I just did not have the energy to work something up. 2. Life got a bit busy so I had to reprioritize a bit in order to stay somewhat sane. I've redone my blog a bit, YAY! I personally love the cleaner, more simple look. I'd love to hear what you think! I wanted to start up blogging again. I've been able to start 2016 with a more disciplined schedule that allows me to have some more time to do something other than go to work, school, and do homework. Therefore, I thought I'd put in some time creating some content for you to read/view. To begin, I thought I'd share some of my favorite moments from 2016 so far. 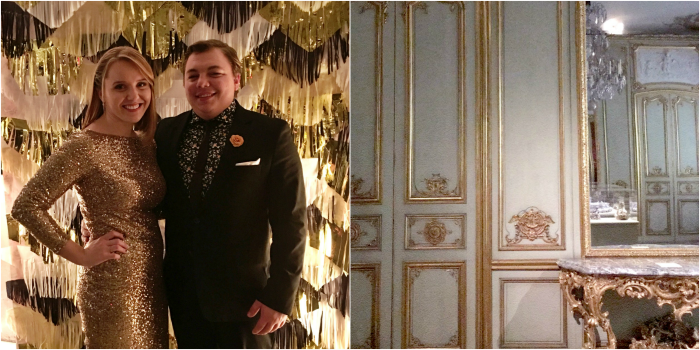 ♥ My love and I began the year with some sparkle and floral. I'd say dressing up was my favorite part of New Year's night. You may think otherwise, but I absolutely loved our outfits. ♥ There's a new sightseeing place that opened up in Philadelphia towards the end of 2015, the One Liberty Observation Deck. 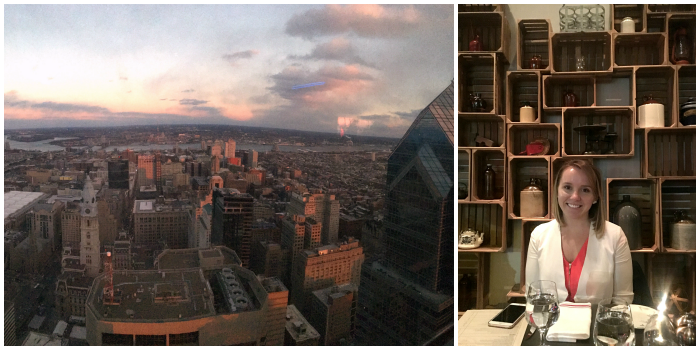 You're basically 57 floors above Philadelphia and it is absolutely stunning, especially to watch the sunset! It made me realize how much I take the beauty of my city for granted as I walk the streets daily. ♥ If you're ever in Philadelphia, I highly recommend stopping by for a nice dinner at Bank & Bourbon. We went there the evening before Valentine's Day and everything about the place was abdolutely divine! The food, the service, the atmosphere. You can also stop by the Loew's Hotel next door and take the elevator to the highest floor to see another beautiful view of the city. Hope you enjoyed reading this little tid-bit! I'm so excited to start blogging again and am so excited to have a new post up again for you on Monday! How has your 2016 been lately?! I'd love to hear about it!